The Davis Cup competition has been in existence since the start of the 20th century. Today, it is a function of the ITF (International Tennis Federation), but its beginnings were not nearly so formal. It began as a challenge between the United States and Great Britain to determine who had the best tennis players—the concept dreamed up by some Harvard tennis players. One of the Harvard fellows bought the silver cup awarded annually—Dwight Davis. Therefore, the name of the tournament evolved from International Lawn Tennis Challenge to the Davis Cup after the man whose trophy was awarded to team winners. The challenge gradually expanded to add France, Belgium, Austria and Australia in 1905. By 1920, the number of teams participating had increased to over 20 and, by 1969, to over 50. By now, the Davis Cup competition includes 123 nations who participated in 2012. In 2007, 137 countries were represented—a far cry from the two nations who began the series. The United States has won the trophy the most with 32 wins. Australia has won it 28 times, with Great Britain and France each winning nine times. Sweden brought home the cup seven times. Early on, it was easier to repeat as champion because prior to 1972, if a team won the Davis Cup in the previous year, the following year, the team just had to play one tie—the final, while the “challengers” had to fight it out in zonal competitions throughout the year. The evolution of the format has been very interesting and necessary with over 100 teams participating every year. Throughout its long history, the Davis Cup has fielded some remarkable teams that dominated the competition for over a year—often several years. Here are the best teams in Davis Cup History. As a society, we love upsets—when the decided underdog comes up big to knock off the reportedly sure winner. It levels the playing field for that brief moment and we all feel empowered. So, when Lukas Rosol sent Rafael Nadal home during their second round match at the All-England Club on Thursday, it marked a true upset. One of the most startling exits at Wimbledon in recent years. As Rosol remarked in his post-match interview, Nadal is only human. As such, even the great Nadal has some moments when he does not play his best for whatever reason pundits can determine. For his part, Nadal had not looked comfortable at all during his early round matches at Wimbledon in 2012; but no one suspected that the world No. 2 could be defeated at this point of the Wimbledon fortnight. As we look back surveying previous Wimbledon tournaments, determining upsets is a matter of degrees. Whenever the unexpected happens, we call that an upset. We will use that criteria for discussing some of the greatest Wimbledon upsets in the history of the Modern Era in tennis. The matches discussed here are listed in chronological order. The debate about which upset is the most shocking will be saved for a later day. Certainly this upset of Nadal on Centre Court in 2012 ranks right up there as one of the most shocking. Roger Federer defeated defending champion Pete Sampras in the 4th round of Wimbledon in 2001. Since 1950, the lush lawns of Wimbledon have staged some of the greatest tennis matches of all time. Many of those battles have been waged on Championship Sunday as two finalists faced off on opposite sides of the net to determine who would claim the vaunted title that year. Throughout the decades the champions seemed to come in waves from Australia early on, then Sweden, the United States and lately from Switzerland, Spain and most recently from Serbia. The twelve greatest champions of the past 60 years won multiple titles after working through the draw to reach the final at the All-England Club. Until recently, most truly successful played serve and volley tennis—a game which seemed unbeatable on grass. Now, however, base-liners rule Centre Court. Base-line players supplanted serve and volleyers as the seemingly less aggressive game style dominated, enhanced by new racket technology while the grass surfaces reportedly slowed significantly. As Wimbledon gets underway in 2012 world No. 1 Novak Djokovic hopes he will capture his second Wimbledon championship. Rafael Nadal desperately wishes to seize his third title on the grass while Roger Federer anticipates winning the Wimbledon trophy for the seventh time and, in the process, recapture the No.1 ranking. As usual, the Wimbledon championship is eagerly anticipated with much riding on the outcome. See whose name is added or moved up on the Wimbledon winners list once the fortnight ends. The French Open is the only major played on clay. Regarded by many players as the most difficult grand slam to win, the first French Open was held in 1891. But it was not until 1925 that the tournament moved to the grounds of Stade Roland Garros. The French Open is the only major still played on clay. Playing tennis on clay was once deemed a special art. 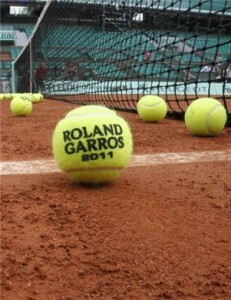 Roland Garros became the arena for clay court specialists. Even today’s players utilize a particular skill set to do well on the clay court surface––which not only slows down the ball but can produce a high bounce. It takes great patience, but learning to play on clay also provides a good foundation for doing well on all surfaces. Winning in Paris is essential to winning a grand slam. Very often, lack of success at Stade Roland Garros has kept many a player from winning that elusive fourth major. Few players have won a grand slam––all four majors in a calendar year. For the men, there was Don Budge in 1938 and Rod Laver in 1962 and 1969. For the ladies, Maureen Connolly Brinker won in 1953, Margaret Court in 1970 and Steffi Graf in 1988. These three ladies all won calendar year grand slams. 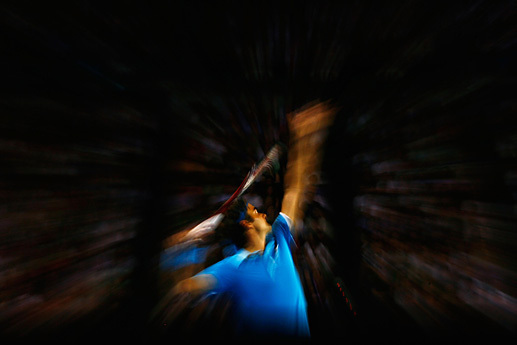 Additionally, many players have won a career slam––winning at all venues during the course of a tennis player’s career. The men who have won career slams are Fred Perry, Don Budge, Rod Laver, Roy Emerson, Andre Agassi, Roger Federer and Rafael Nadal. For the ladies the career slam belongs to Maureen Connolly Brinker, Doris Hart, Shirley Fry Irvin, Margaret Court, Billie Jean King, Chris Evert, Martina Navratilova, Steffi Graf and Serena Williams. Many great players have been stopped because they could not negotiate the clay. Following are the top 10 players who could never find a way to win that elusive French Open title. Roger Federer serves in 2010, winning the Australian Open that year. It used to take 45 days on a ship to get to Australia from Europe. For that reason, in the early days, the Australian Championships were not well-attended by players outside of Australia and, at times, or even by their own players. But as the world grew smaller, the importance of this colorful slam down under grew until now it ranks up there with the other three, receiving the attention from the players and the media the Australian Open so richly deserves. This year as the 2011 Australian Open gets underway, the world is focused on many fascinating tennis stories. For example, the women will be looking to crown a new champion with the absence of last year’s winner and former World No. 1 Serena Williams. On the men’s side, the questions center on whether Rafael Nadal will be able to complete his “Rafa Slam,” winning the Australian Open––owning all four major titles at one time. No one has accomplished that since Aussie Rod Laver completed his own grand slam in 1969. There is also much speculation wondering if Roger Federer, who is the defending champion, can win career grand slam title No. 17. 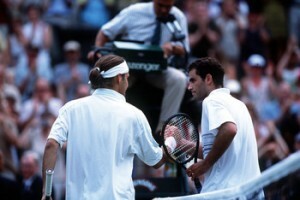 It would also give Federer five Australian Open Championships, which has not happened in the Open Era of men’s tennis. Such a win would surely boost Federer higher on the list of the 20 all-time greatest Australian Open Champions. 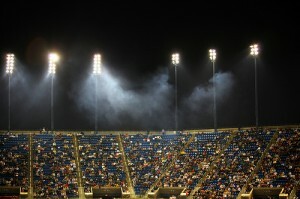 Night Sessions at the U.S. Open are momentous occasions. Looking at the modern era or from 1968 forward, how many times has the number one seed or one of the top seeds gone down to defeat unexpectedly in New York during the U.S. Open? Here are some of the most famous upsets listed here in chronological order. Ornates won 6-4, 6-3, 6-3. In 1975 Jimmy Connors, the No. 1 seed defeated his arch rival Bjorn Borg in the semifinals while Spain’s Manuel Orantes defeated the No. 2 seed Guillermo Vilas in a very difficult match to reach the final, facing Jimmy Connors. The Open at Forest Hills was being played on clay in 1975. Connors was having a bad year, for him, losing his Australian Open crown to John Newcombe and his Wimbledon trophy to Arthur Ashe. His back was against the wall as the American faced the Spaniard Orantes, trying to retain his hold on the No. 1 ranking. 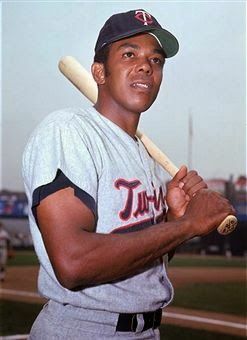 The clay surface obviously benefitted Orantes. But Connors had defeated the Spaniard in six of their last seven meetings and felt confident going into the match that he would win again. Orantes never let the American into the match. The Spaniard played slow, denying Connors pace, never allowing him to establish a rhythm. Orantes lobbed and passed Connors at the net with amazing accuracy.